How did Yonah Mountain get its name? The Cherokee Indians were well established, and considered to be the first inhabitants of the region that includes Georgia. These people are credited with naming several geographical areas, rivers and mountains and many of these Indian names still remain today. Mount Yonah was one of those areas named by the Cherokee Indians and this name, "Yonah", was an Indian word that means "bear". In addition to being known as Bear Mountain, Yonah Mountain was often called Sleeping Bear Mountain. Yonah Mountain is also commonly referred to as Mt. Yonah by old-timers and people local to North Georgia, and Yonah Bald amongst the area`s rock climbing enthusiasts. 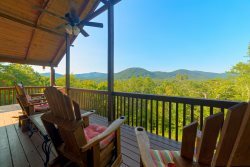 As the crow flies, this popular mountain is about 4.5 miles from Helen, and several of our vacation cabins are in the vicinity of the mountain, with incredible views from the deck of your vacation cabin. Nacoochee steals away from her father`s log house to meet with Sautee, under the giant oak. By this time, they are hopelessly in love. The young lovers flee to nearby Yonah Mountain, spending a few idyllic days in a secret cave known only to Nacoochee. But destiny calls to a larger purpose - peace between the two great tribes. To this end, out they come to face Wahoo. He is blinded by hate and chagrin that Nacoochee would choose a Chickasaw for himself. He ordered Sautee thrown from the cliffs of Yonah Mountain, while Nacoochee is forced to look on. Seeing no future without Sautee, Nacoochee tears away from her father as she leaps from the high cliff. The young lovers are joined again at the foot off the cliff. They drag their broken bodies together, and locked in final embrace, the two Indian lovers die. This is how Wahoo finds them. It is too late, and Wahoo is now overcome with remorse. He has the two bodies, still locked in death together, laid to rest on the banks of the Chattahoochee River, there to remain for eternity. In their honor, he renamed the two valleys where the young lovers first met - one for Sautee and the other Nacoochee. Nacoochee Indian Mound was the center of the ancient Cherokee town of Gauxule, visited by DeSoto in 1540 in his search for gold, according to legend. On this ceremonial mound, 190 feet long, 150 feet wide and 20 feet high, stood the Town House where a sacred fire burned unceasingly. Ceremonial dances were performed in and around the Town House. Residents of the town lived on the flat land surrounding the mound. The findings of Heye Foundation archaeologists who explored the mound in 1915 indicate the advanced cultural development of the builders. The 173-acre Hardman Farm is located in historic Sautee Nacoochee, just south of Helen. Best recognized by its gazebo-topped Indian mound and cow pasture, this is a favorite landmark in north Georgia. Visitors can make reservations for guided tours of the house and dairy barn. Built in 1870 by Captain James Nichols, the house is a grand example of Italianate architecture and was originally known as "West End" because it was at the west end of the Nacoochee valley. Guided house tours include the 19th-century parlor, original lighting, and interesting telephone and climate control system. Visitors will also see the bedroom belonging to Anna Ruby Nichols, the namesake of nearby Anna Ruby falls. The large barn was the focal point of Nacoochee Dairy that operated from 1910 until the mid-1920s. During tours, guests will learn how milk was processed and transported in the past, plus they will see a spring house and former horse barn. The last owner of this property was the family of Dr. Lamartine Hardman who was Governor of Georgia from 1927-1931. It was lovingly preserved and donated to the state of Georgia in 1999. The Nacoochee Mound is a burial site and was probably used long before the Cherokee inhabited the area. Reservations for guided tours of the house and first floor of the barn are recommended. Visitors must be accompanied by park staff when inside buildings. Group reservations are required.